By the Guangxu period, porcelain production at Jingde Zhen was in decline, and thus the exceptional quality of the present example makes it a rarity. The shape and style of painting are reminiscent of the first half of the nineteenth century, being based on Daoguang porcelain bottles; the only feature that sets it apart is the quality of the cobalt used in the underglaze-blue decoration. This bottle demonstrates, however, that there was continued production of fine porcelain bottles till the last decades of the nineteenth century. 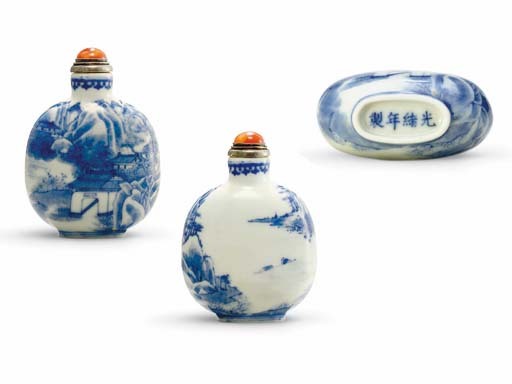 It is also very rare to find blue-and-white snuff bottles with a Guangxu mark. Similar painting can be seen on an iron-red-decorated Daoguang-marked snuff bottle, formerly from the J & J Collection, and sold in these rooms, 29 March 2006, lot 26.